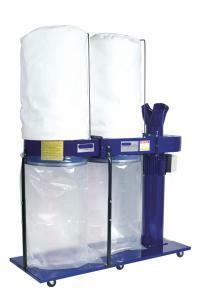 The biggest dust extractor in our professional range, with two large collection bags to run for longer times. The high volume of air moved means this unit is capable of extracting from three machines simultaneously or multiple smaller machines. The maximum recommended hose length between extractor and collection is 10 metres. We now fit as standard super fine 2 micron filters making the unit suitable even for MDF dust. Supplied with a steel fan, 3 way inlet, four wheels, quick release metal straps on all bags. A 16 amp supply is required to run the 240v version. Available in single or 3 phase options.